I recently, I read a Forbes article about Publix. The article discussed the Publix business model and, to put it in layman’s terms, why it is such an awesome company. The key point the article makes is that Publix’s success can be attributed to it’s culture of putting “people-first”. By “people” I don’t just mean customers. They also have put their employees first, which makes them happy, and ultimately makes for happy customers. They ACTUALLY read what I posted, and cared enough to comment on it. And just like that, I love Publix even more. How is that possible? Social media is such a large component of marketing these days, and it’s nice to see that some companies are using it correctly. Many companies use automatic replies or autobots, as I call them, to respond to their online followers. They forget that social media is a way of directly communicating with customers. Using robots can really fray relationships you may be trying to build or maintain. One company recently made headlines for its insensitive automatic responses to its twitter followers. By automating its tweets, the company validated exactly what it has been trying to negate: the perception that it is “too big” and doesn’t care about its customers. Even without automated responses, companies tend to fall into the trap of assigning one person to reply with generic messages rather than with ones that will make the customer feel unique or cared for. In today’s digital world of dog eat dog, it’s important for companies to keep strong ties to their customers and potential customers. What easier and cheaper way to do this than through social media? This week in class we were assigned to read a case study about paywalls. Specifically, the article discussed a history of The New York Times paywall and the paywall trend in the newspaper industry. 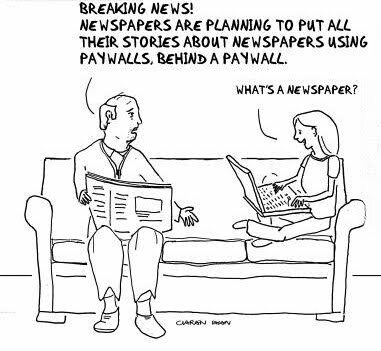 Paywalls are online payment systems that require online newspaper readers to pay for reading articles. The New York Times has what is called a “soft” wall because it allows readers to read up to 10 articles for free per month, before having to pay for the content. It seems this paywall and previous iterations of it have been met with criticism because many people feel that they shouldn’t have to pay for their news. And while I am the first person to admit that all my news consumption comes from free articles online, I still have mixed feelings about the paywall. Newspapers (the print versions) were and are not free. However, news today is consumed very differently and the same business model that worked for newspapers does not work for their digital counterparts. People today don’t entirely rely on a newspaper to get their daily dose of news. And with so many free online news sources available, it is difficult to justify charging people to read content. I think the soft wall is a happy compromise. For people who already subscribe to the paper version, this is not even an issue. And for people who read more than 10 articles per month, they can either pay, wait out the month, or read another newspaper. News, after all is (supposed to be) unbiased, so if you just want a high-level read on a subject, the internet has plenty of free and reputable news outlets available. What are your thoughts on paywalls? Are you one of The New York Times loyalists? Do you pay for your content online?